We would like to order 2 Black forest wine kits. What is the price and the shipping. When will these be available. I would like 1 wine kit when they come available. Hi Alice, there are some Black Forest Dessert Wines available in Canada. Please use our store locator to find a store near you and check for availability. What month do the Cru Black Forest Dessert Wine kits become available in 2017. You should start seeing the Cru Specialty dessert wines start to arrive in market around mid-August 2017. We suggest you contact the store near you (found in our store locator) to order yours soon! Would like to know the cost of the Black Forest Dessert wine? Hi Corinne, Thank you for your question! We are a manufacturer and distributor of craft wine kits, and as a result do not retail direct to consumers. We do have wonderful, independently owned retailers across Canada who would be happy to assist you with confirming pricing for this dessert wine, as pricing is dependent on the store. We recommend you find a store near you and contact them to get started: https://www.rjscraftwinemaking.com/find-your-store/! Let us know if you’ve any other questions. Do you distribute a Black Forest Port? Will this dessert wine be available this summer? Thank you for your question! 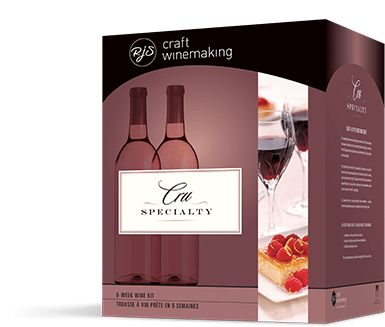 We are a manufacturer and distributor of craft wine kits, and as a result do not retail direct to consumers. We do have wonderful independently-owned retailers across Canada and the US, who would be happy to assist you with purchasing this kit as there are still some quantities remaining of this limited release! We recommend you find a store near you and contact them to get started: https://www.rjscraftwinemaking.com/find-your-store/. Please know that it will be available again in August/September for the Fall! Is it supposed to be served chilled? Hi Kelvin, it’s your preference, you can enjoy the wine either way.